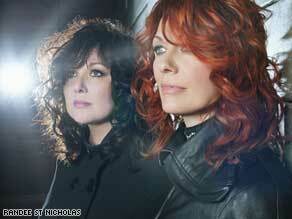 Ann and Nancy Wilson of Heart. ST. PAUL, Minnesota (CNN) - Blasting through the Republican convention hall is the 1977 hit "Barracuda" by rock band Heart. It's a shout-out to Sarah Palin. When she played basketball in high school, the soon-to-be Republican vice presidential nominee earned the nickname "Sarah barracuda" for her fierce competitiveness. Some of her opponents revived the "Sarah barracuda" nickname after she became mayor of her hometown, Wasilla, in 1996, defeating a three-term incumbent. hope our wishes will be honored," the group said in a statement that said they "condemn" the use of the song at the Republican convention. I would think that anyone would want to use the music of a washed up group.